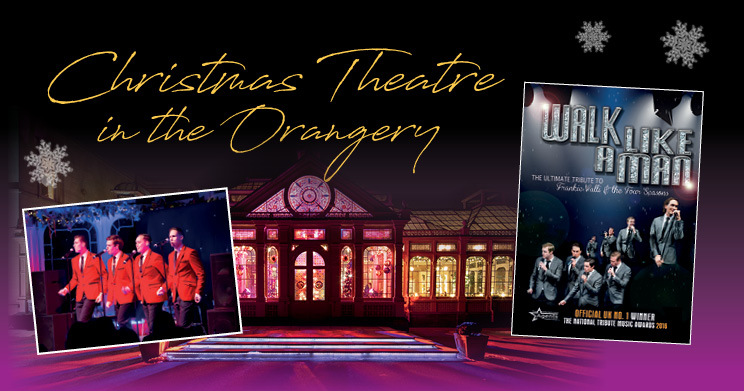 Following their amazing shows in the Orangery last Christmas – playing to sold out audiences night after night – we are delighted to welcome back ‘Walk Like A Man’ to start the Festive season with a flourish! Winners of the National Tribute Awards 2016 for Best Four Seasons Tribute and pumping out classics such as ‘Big Girls Don’t Cry’, ‘Sherry’, ‘Can’t Take My Eyes Off You’ and many many more, ‘Walk Like A Man’ is the ultimate celebration of Frankie Valli and the Four Seasons! 2nd, 9th, 24th, 25th or 26th December. Dress Code: Lounge suits, black tie optional. Arrival Time: 6:30pm (matinees 1.30pm). Dining: 7pm (matinees 2.00pm). Carriages: 11pm (matinees 5.30pm). Mulled wine on arrival. Table Seating: Parties under eight people will be seated with fellow guests at tables of eight. Parties over eight people will be seated at long banqueting tables or round tables. Prices include ticket, welcome drink, three course dinner plus coffee & petit fours. What better way to begin your festive celebrations than enjoying a relaxing night’s sleep at the Hotel complete with full English breakfast. These exceptional rates are only available when attending the theatre evening. Bedroom rates are per room, per night based on two people sharing a Garden Room. Check in time for bedrooms is from 4pm.